For more photos, options, sizes and details of this unit see. Web site for more info. The column is made from 1.5 X 30 copper pipe and Cooling is achieved with a copper condenser tube, so no WORM is required. 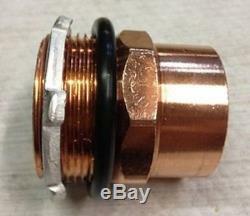 This is the Copper Column and adapter to attach to Still. The same column that comes on the NR11 & HD8-30 Still. What you get in this package. Male Adapter, O-ring & Lock Nut included. Owning this still is legal for distilling essential oils and water. It is also legal to own a moonshine still, for display and show. Always check local laws, as they may differ from area to area. It is illegal to distill alcohol in the United States without proper licensing. Please, do not use this item for the distillation of alcohol unless you live where it is legal to do so or have the proper permit. Fermentation instructions and materials are provided to create a beer or wine product which is legal in the United. And for educational information only. The item "30 Copper Column with adapter, Alcohol Moonshine Ethanol Still E-85 Reflux" is in sale since Monday, July 10, 2017. This item is in the category "Home & Garden\Food & Beverages\Beer & Wine Making". The seller is "bigorangestevve" and is located in Bowling Green, Kentucky. This item can be shipped to United States, Canada, United Kingdom, Denmark, Romania, Slovakia, Bulgaria, Czech republic, Finland, Hungary, Latvia, Lithuania, Malta, Estonia, Australia, Greece, Portugal, Cyprus, Slovenia, Japan, China, Sweden, South Korea, Indonesia, Taiwan, South africa, Thailand, Belgium, France, Hong Kong, Ireland, Netherlands, Poland, Spain, Italy, Germany, Austria, Israel, New Zealand, Philippines, Singapore, Saudi arabia, Ukraine, United arab emirates, Qatar, Kuwait, Bahrain, Croatia, Bahamas, Viet nam, Uruguay, Switzerland, Antigua and barbuda, Aruba, Belize, Grenada, Saint kitts and nevis, Saint lucia, Barbados, Bangladesh, Bermuda, Bolivia, Ecuador, Iceland, Jordan, Cambodia, Cayman islands, Liechtenstein, Sri lanka, Luxembourg, Macao, Martinique, Maldives, Nicaragua, Oman, Peru, Pakistan, Paraguay, Reunion.